Designed to look like classy champagne bottles, these super-sized party poppers are a festive addition to any celebration. Ideal for creating a wow party moment! 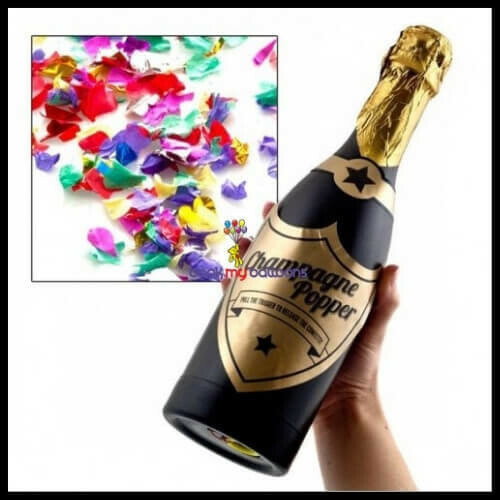 Whether for New Yearﾒs Eve,birthday or a wedding, your sentiments will be perfectly expressed when you pull the trigger to release the multi-colored confetti inside the bottle. Perfect for creating a WOW moment at any party and will certainly give you the reputation as the host not satisfied with the status quo. The stylish confetti holders make great table decorations, ready to send a shower of sparkly streamers into the air at a momentﾒs notice. The perfect choice to mark the end of a toast or to start a party off with a bang. Try handing them out to coordinate a psychedelic explosion at the end of a countdown or leap out and surprise the birthday boy or girl with a cascade of rainbow-coloured confetti when they least expect it!